Image: Getty Images. Design/Ashley Britton/SheKnows. Now that marriage equality has (finally!) been secured and validated, new generations of LGBTQ individuals are seeing parenthood as a part of their future. In fact, the majority of queer millennials are considering becoming parents in the coming years. While parenthood, in many ways, is similar for all who enter into it, there are some unique differences for the LGBTQ community. I work for the Family Equality Council, a national nonprofit organization advancing legal and lived equality for LGBTQ families and for those who wish to form them through building community, changing hearts and minds and driving policy change. 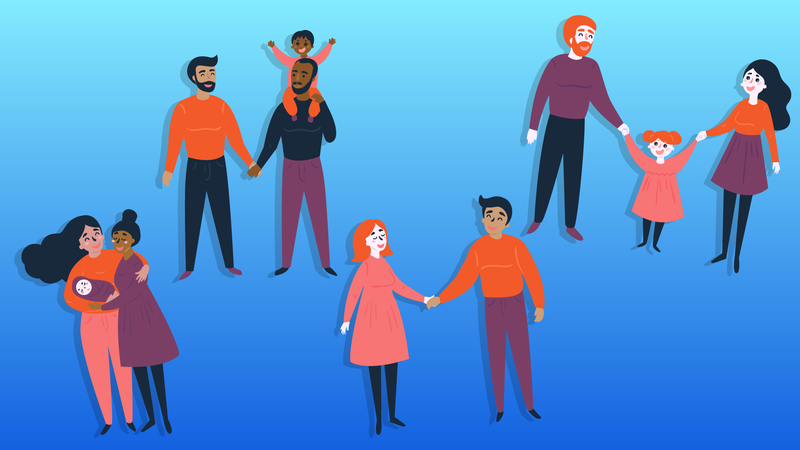 Helping support LGBTQ people through the challenging process of forming a family is a central part of our work, so let’s get to it: Here are the most important things you’ll need to know if you’re an LGBTQ person thinking about becoming a parent. There are certainly some folks in the LGBTQ community who have all the necessary parts and ingredients to conceive a child within the context of their relationship. For the rest of us, though, this process takes planning. Whether through sperm/egg donation, in vitro fertilization, reciprocal IVF, adoption, foster care, surrogacy, co-parenting or another method, you will most likely need to create a roadmap to parenthood. Determining whether a biological connection to your child feels critical to you will be the first major decision you will likely make. From there, you will work through decisions about known/unknown donors, domestic vs. international adoptions, foster care of younger children vs. older children and many, many more. Taking the time to develop a plan that highlights nonnegotiables for everyone involved will set you up for success as you journey down your path. We all know a typical pregnancy is 38 to 42 weeks. Tack onto that fertility treatments, matching with a surrogate, being paired with a birth parent or being matched with a foster child… and that timeline can extend significantly. The typical adoption waiting time to be placed with an infant is six months to two years. Foster care placements typically happen more quickly, but you will need to factor in several months to become trained and certified as a foster family. Fertility treatment ranges depending on your own unique health factors. If you think you may want to have a biological child and you are either nearing your mid-30s or you’re a person with ovaries who is thinking about transitioning before becoming a parent, you may want to consider freezing your eggs or sperm to have them available to you when you are ready. Regardless of the path to parenthood you choose, you will most likely need a lawyer to secure parental rights for nonbiological parents (via a second or stepparent adoption). If you are using a sperm/egg donor or surrogate, a lawyer is even more critical to ensure the donor’s parental rights have been terminated. Identify an LGBTQ-friendly family law practitioner early in your process. They can help you prepare necessary legal documents as you progress through the journey. While we rarely ask heterosexual couples how they formed their families, be prepared to be peppered with questions from the community whenever you are out and about as a family unit. People seem surprisingly comfortable asking deeply personal questions of strangers (“Who carried her?” “Do your kids have the same sperm donor?” “Who is the ‘real’ dad?” “Did you adopt them?” “Are you both breastfeeding?”). Take some time to come up with your responses to these types of questions before leaving the house. While often well-intentioned, these questions can feel off-putting in the moment. Having a canned response ready can make an otherwise awkward situation pass quickly. When you become a parent, whether LGBTQ or not, you are suddenly a magnet for unsolicited parenting advice. Everything from what and how you feed your child to where they sleep and which car seat they use will be up for debate. There will be those in your life who you will naturally turn to for advice on these topics, and then there will be… every random type of person you meet once you become a parent. Remember that you are this child’s parent, and you do not need to justify your decisions to anyone. So do your research and make decisions that work for your family. New parenthood can be an isolating time. If you have a newborn, you may feel like it’s impossible to leave the house in between naps, feeding and diaper changes. If you adopt or foster an older child, the kinds of outings that you take will look very different from your life pre-kids. We know that LGBTQ individuals tend to rely more on families by choice than families of origin. If your families of choice are not yet parents themselves, you may find yourself without the social support you had prior. Seek out other LGBTQ families in your area. Find a queer postpartum doula to support you! Join a virtual queer parenting group. (Check out Family Equality’s National Network for suggestions). Let your friends and family know what you need (meals, naps, a shower). Attempt to create a village around you prior to a baby or child coming into your home. Once they are there, it may be hard to ask for what you need. You hear it all the time; parenthood is a game-changer. It changes everything about how you live your life. The decisions you make about where you vacation, which job you take, even what time you shower will shift to reflect the needs of your family unit. Bringing a child into your home is simultaneously the most meaningful and overwhelming change you can make. It will be a new level of challenging and rewarding all at once. But is it worth it? Well, ask any parent you know and we’re pretty sure they’ll say yes. Access more resources from Family Equality’s Path 2 Parenthood program by visiting The Family Equality Council online.